Why yes, they do taste as good as they look! Happy Jewish American Heritage Month! I realize that May is almost over, but I’ve been busy baking all sorts of treats, including multiple birthday cakes. In fact, today’s cookie is sort of cake-like when baked properly. Last year, we celebrated two of the most popular Jewish culinary contributions to America: challah and rugelach. Today’s recipe is believed to have Jewish roots as well, although its origins are pretty fuzzy. 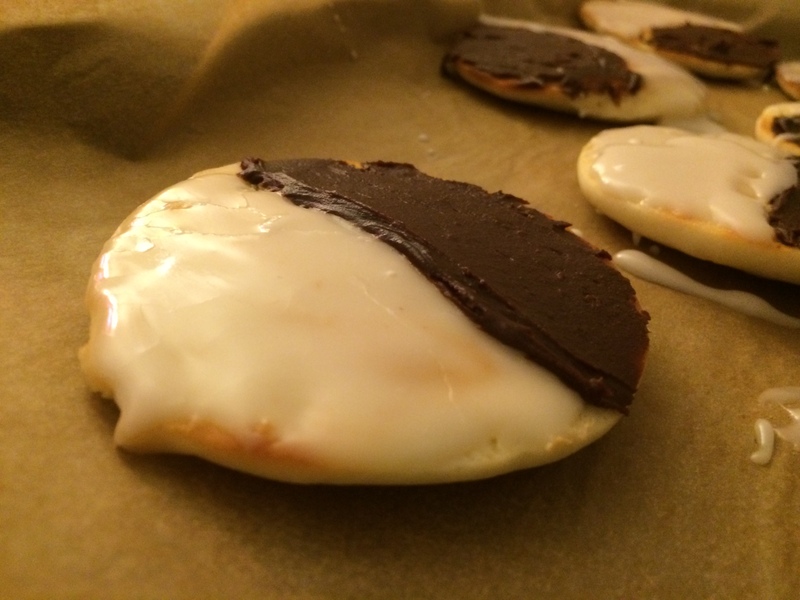 Unlike rugelach and challah, black and white cookies (also known as half-moons) likely were NOT brought from Europe with Jewish immigrants. In fact, the story may be the other way around! Minerva is sooo happy Passover is over! 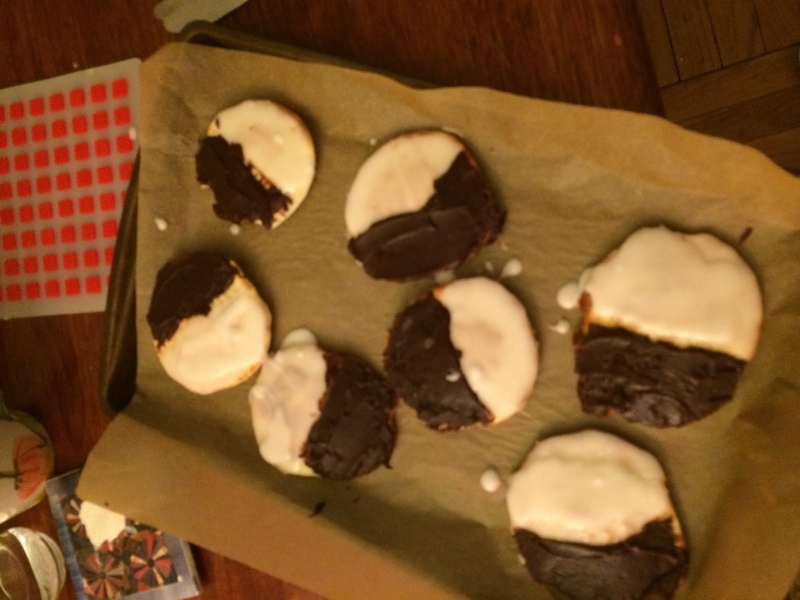 Many food historians trace black and white cookies back to New York, where Jewish delicatessens offered a wide range of baked goods using familiar and new ingredients from their nations of origin and the United States respectively. The cookies were probably developed sometime in the early 20th century, the peak of Jewish immigration to the United States (and in particular New York’s Lower East Side). Some credit Hemstrought’s Bakery of Utica, New York, as the innovator of black and white cookies, but this has not been verified. In fact, it is entirely plausible that a non-Jewish bakery created the confections, and kosher-style delis simply followed suit. To further complicate matters, Germany has a similar cookie called an Amerikaner, which very well may have been introduced by American soldiers during and after World War II, bringing the cookie full circle. The black and white cookie’s ambiguity is just another example of why I love history. We are always in pursuit of more evidence. This recipe makes dozens of cookies (no worries, they freeze well). 1) In a large bowl, combine flour, baking powder, and salt. Cake flour makes these cookies soft and fluffy. 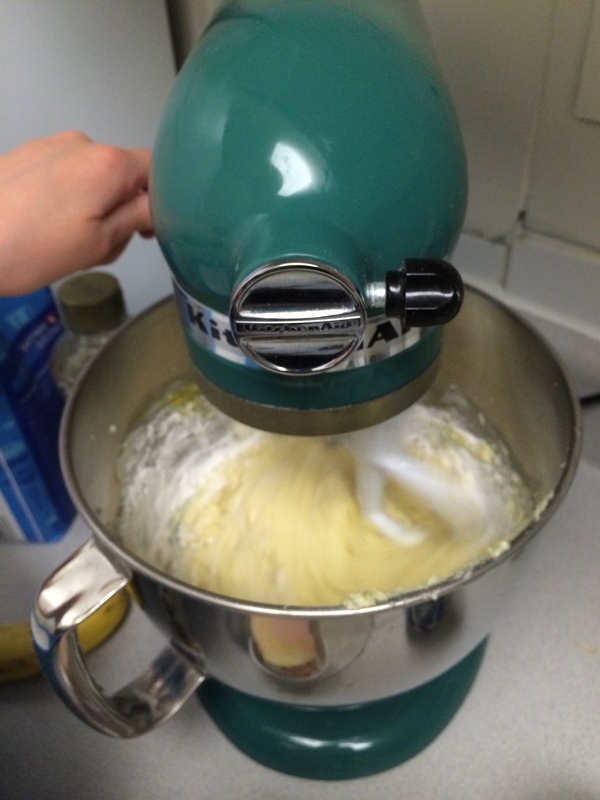 2) Use your Minerva or handmixer to cream butter. Gradually add sugar and beat until light and fluffy. 3) Add eggs, lemon zest and juice, and vanilla and lightly mix. 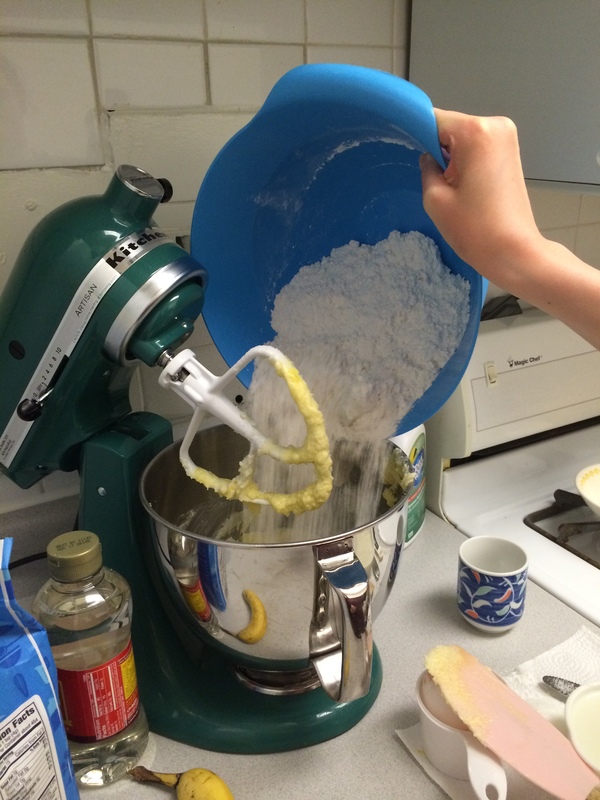 4) Alternate adding dry ingredients and milk to butter mixture. Stanton is taking this whole dough scooping process very seriously. 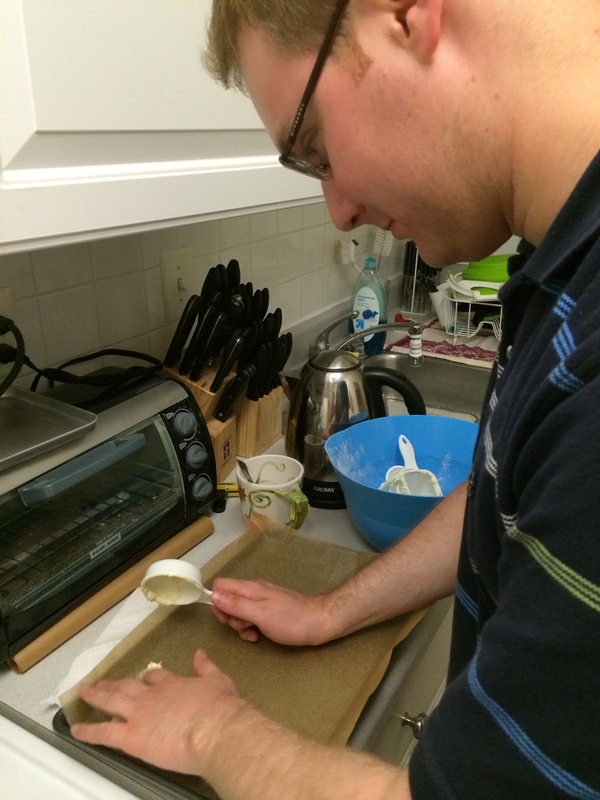 5) Line baking sheets with parchment paper. Scoop ¼ cup of batter and gently plop on tray. Flatten slightly (these are NOT drop cookies). Repeat, leaving two inches or so between each cookie. 6) Bake at 375 degrees for 12-18 minutes, until cookies are just slightly brown. Allow to cool completely before removing. 7) Make the icing: Melt chocolate in microwave on 20-second intervals (otherwise it will burn) and set aside. Add water and corn syrup to a saucepan and slowly bring to a boil. Remove from stove and add powdered sugar and vanilla. Pour ¾ cup of the mixture into the chocolate bowl. Stir until combined. You now have 2 icings! 8) Ice the cookies: Flip cookies upside down. Using a spoon or knife, frost half of the each cookie with vanilla icing, then chocolate. 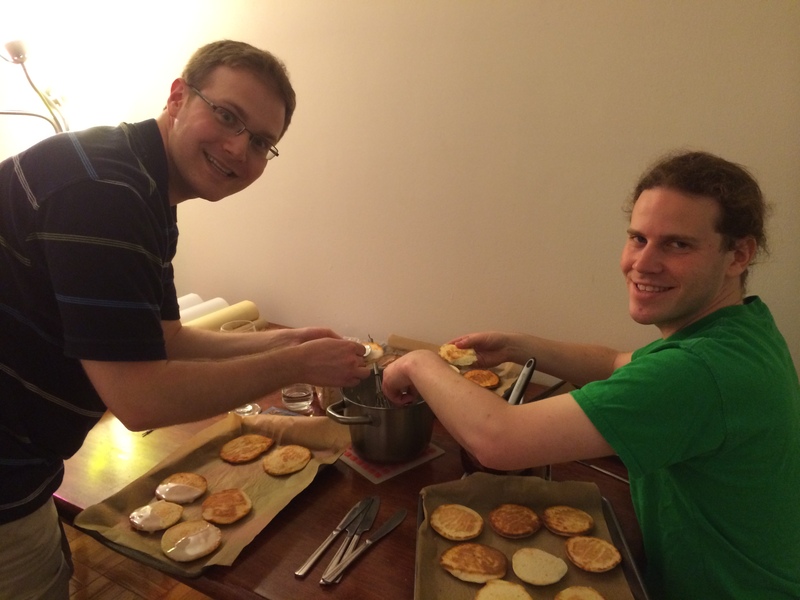 Stanton and Jake helped ice all of the cookies at 11 pm. Thanks guys! ***Tip: Use layers of wax paper to prevent cookies from sticking together during storage.